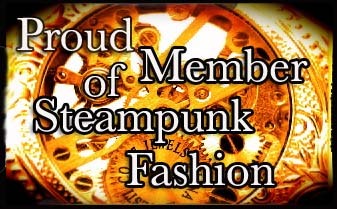 This community was created for members such as yourself to share your take on what Steampunk fashion is. We are interested to see your creations, though this doesn't necessarily mean you must have sewn or created your attire; combining items into a well-coordinated outfit counts too. We also enjoy seeing interior decoration and other gadgets relevant to the visual style of steampunk. Steampunk is the science fiction of the steam age, re-imagined with the advantage of modern hindsight. Drawing upon the wealth of historical technology and the scientific fantasies of the Victorian and Edwardian periods, steampunk seeks to reinvent modern wonders such as the computer as the people of the age might have envisioned them. Following in the footsteps of Jules Verne and H. G. Wells, steampunk authors blend history, science and imagination into a world of wonder that might have been. The Best rule of thumb : Have fun and be yourself. That's what this is about. Don't feel compelled to conform with everyone else. Don't feel shy about posting just because you don't want to dress like the other people who you've seen post. And don't post with the question "do you guys think this is steampunk enough?" Post with the statement "I feel that this is steampunk, and here is why I think so." At worst, someone will disagree and then the two of you can discuss your conflicting views, get to know each other, and come to an understanding; or, you can simply feel free to ignore them, and you have every right to do so if you don't feel like arguing over a simple difference of opinion. Please keep posts regarding things that are other than fashion to a minimum. we, as the moderators, reserve the right to deny any posts we deem irrelevant to the community . Posts with multiple images are greatly loved, just make sure all large images are behind a cut. A Newbie's Guide to Navigating Steampunkfashion; A quick and dirty guide to finding what you need. Banners for your LJ Profiles, MySpace or anywhere you like. Reference for historical clothing to use as a base or to copy.